We first reported on the Climate Count Scorecard back in 2008 for their second annual report. This morning, Climate Counts released their updated scores for 2011, showing Nike as the clear winner for the third year in a row with a score of 87 out of a possible 100. Five companies surged ahead more than 20 points over their 2009 score, including CBS, Clorox, Capital One, PNS Financial (up 40 points since the first ’07 scorecard), and Alaska Air. Some of those companies still have a ways to go to adequately satisfy all the 22 criteria used by Climate Counts (pdf) to score a company’s climate action (the highest ranking of the five fast movers is Clorox, with a score of 57). But given such a healthy surge in 2010, these companies exemplify a general movement in the right direction among the biggest players in the corporate world. Overall, company scores are up 14 percent since last year, and the average score has risen to 50.1 points, up from just 31 points in 2007. This latest release of the Climate Counts scorecard is the first since the Senate’s abject failure to address climate and energy issues. Hundreds of millions of dollars where spent by corporations and their associations to help insure such failure of leadership. To that end, this year Climate Counts has given special recognition to 21 scored companies for their strong and vocal support for climate policy that would help reduce global warming (look for a gold star next to their names). These companies come from nine of the twelve business sectors considered in the Climate Counts scorecard. Another new aspect of this years Scorecard is the launch of the Striding Shopper Campaign, which encourages consumers to vote with their dollars and purchase from companies with a score of 50 or higher. And to make it easier, Climate Counts offers a free iPhone app to keep the scorecard handy (Apple, incidentally, scores a 61, up 9 from last year). 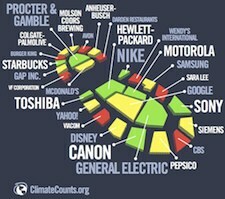 The Climate Counts scorecard is a good way to make corporations responsible for the climate action and policy support. It is up to the consumer – you and I – to make the corporate world aware that what they do and say about climate and sustainability makes a difference to their customers. Let them know you care.